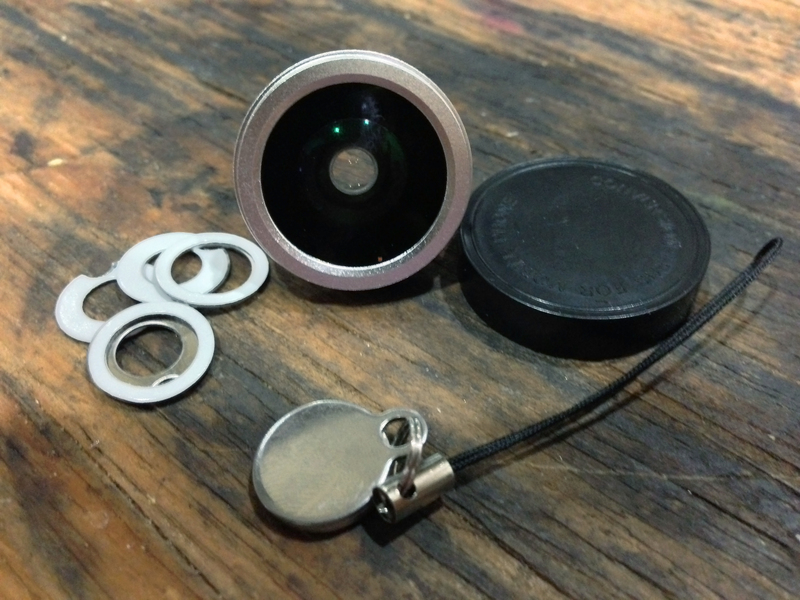 The $49 Photojojo Lens Set is comprised of three lenses typically sold separately at $20 or $25 a piece. Shaving nearly $20 off the price tag, Photojojo sends all three packaged separately in a set. Each box touts its own lens (wide and macro, fisheye, or telephoto) and five adhesive removable metal rings. The rings stick to the back of the iPhone, without blocking the glass and flash, and then a lens would attach to the ring magnetically. Each box also packs a solid cover and carrying lanyard. Now, as for my objections to what’s inside, I think the lanyard is a little useless. The lenses form a strong seal to it, but it also seems a little impractical to carry three individual lenses on three individual lanyards via keychain or whatever. I doubt anyone will use this accessory. My other gripe concerns the sticky metal rings. They securely stick and do not leave a messy residue behind, and one could potentially leave a ring on an iPhone for forever, but they look ugly by themselves. It literally looks like the iPhone has a thin metal washer stuck to the back of it. And, what if you constantly remove and replace the ring and eventually run out of them? I guess you are S.O.L. (unless you buy another set, that is). With that said, the setup is simple. The products also feel good for the price— solid, nice weight, etc., and the box gives an illustrated pic-tutorial on the back to help folks get started in four simple steps. 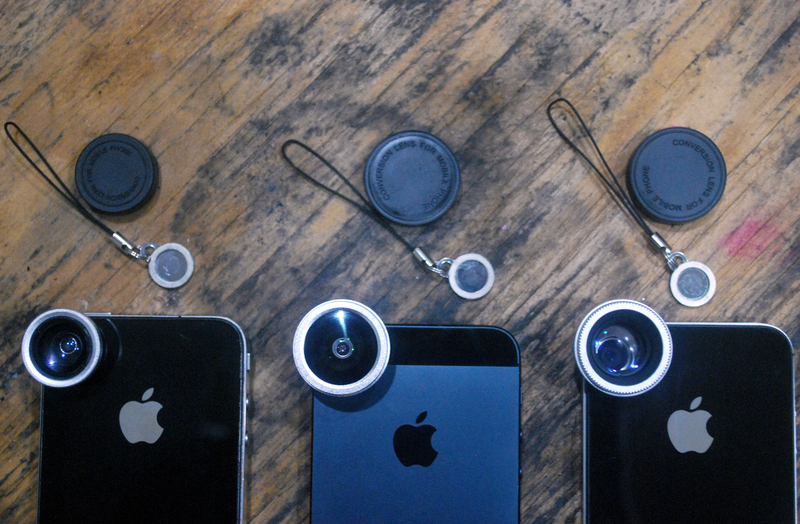 Not too much fuss or mess with this lens set, just quick-and-easy iPhoneography gear. Oh, and this lens set works on practically every model of the iPhone (as evident by the image above the break). The Wide Angle/Macro Lens is a 2-in-1 lens ($20 when bought separately) that is a wide-angle by default. Folks must unscrew the wide-angle lens to get to the Macro below. For those unaware: the wide-angle lens expands the view, while the Macro captures high-quality, close-up detail. The wide-angle did exactly as advertised, but I noticed a touch of blur and a slight loss of clarity. This, of course, is nothing Photoshop cannot correct, but it is always nice to snap a high-quality image without the need of after-effects. Although I tested this lens on a piece of art, which still shows the capability at hand, it’s true beauty would shine on long cityscapes, large group shots, or entire rooms. As for the Macro lens, it improves the clarity and crispness of extreme close-ups by a gazillion percent. It even zooms in a little farther automatically. This type of photography is not necessary on an every day basis, though, but it certainly is fun to play with when trying to capture intense details of bugs, flowers, skin, coins, or whatever you have in mind. The Fisheye lens is an ultra-wide angle lens that wraps photos into round, hemispherical images, and it costs $25 when bought separately. 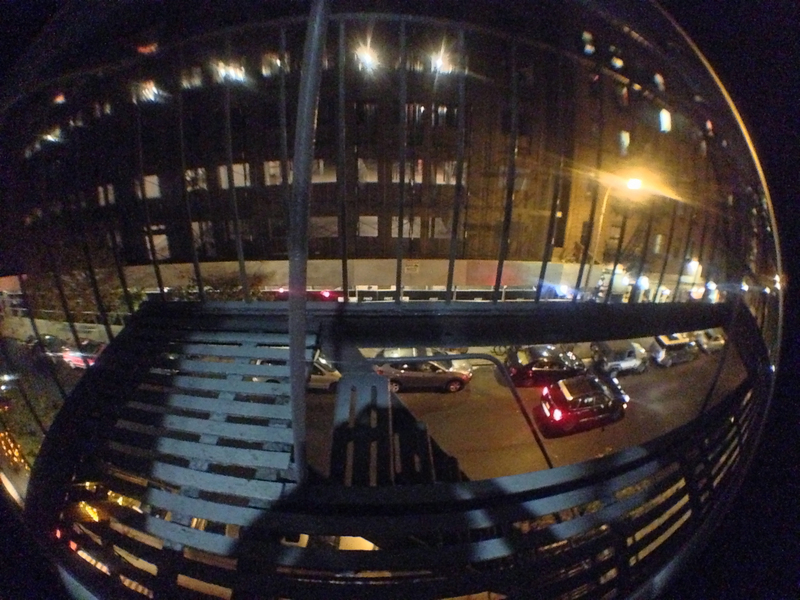 The effect is pretty cool, as it gives a 180-degree field view with a typical amount of distortion. I loved the way it looked and thought it was even more fun to play with in video-shooting mode, but I absolutely hated how the lens created an asymmetrical ring along the peremiter of the shot. A symmetrical ring would not bother me, but I tried and tried and tried for like 15 minutes to get this lens to fit over the iPhone’s lens evenly. All attempts failed. Sigh. So, if you just want a neat bubble-like effect, and do not care about perfect framing, than this is a great iPhoneography toy for you. For those who loathe the processing side effects of digital zoom, behold the Telephoto lens by Photojojo that costs just $20 when bought separately. This little gadget offers 2x zoom without all the messy pixilation of digital zoom. And, without tapping or zooming in with the iPhone, folks can get closer to animals, people, monuments, etc. I thought this was a great lens, despite a touch of blurring around the perimeters of the shot, and it kept most colors and lighting perfectly in tact. The Photojojo Lens Set is in stock at Photojojo.com for $49. It is able to ship through First Class, Priority Mail, UPS Ground, UPS 2-Day, or UPS Overnight. I suggest First Class, as it is only $2.80 extra, while PayPal, Google Checkout, and typical credit cards are accepted for payment.